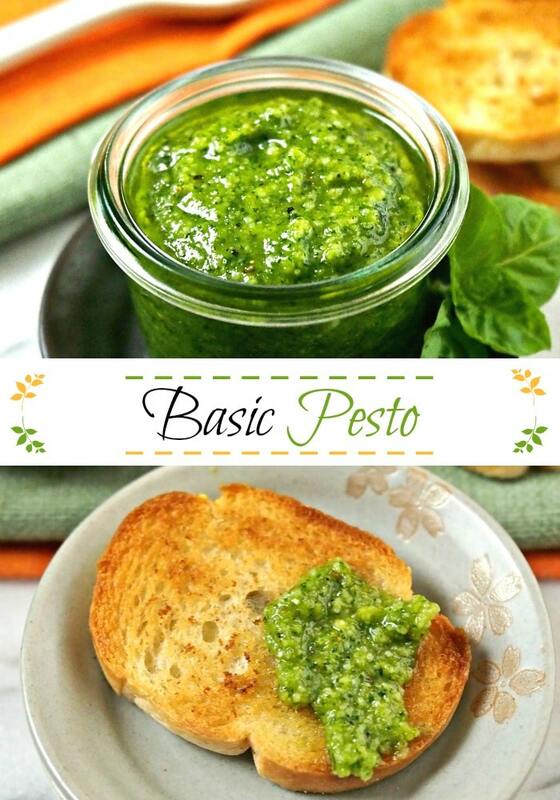 My nickname for Basic Pesto is Best-o Pesto. You might think that’s over-the-top until you taste it. 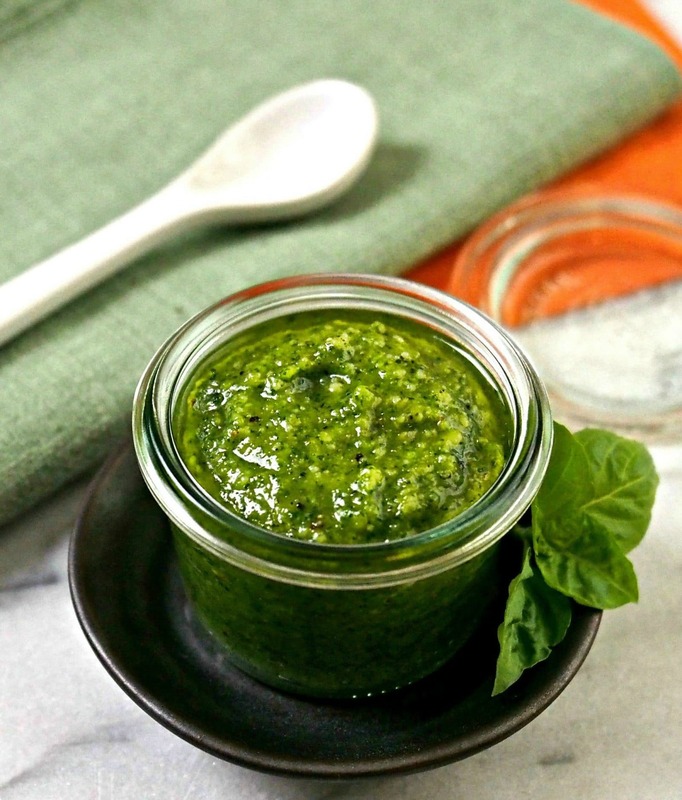 Pesto can be combined with many foods although it is usually combined with pasta. 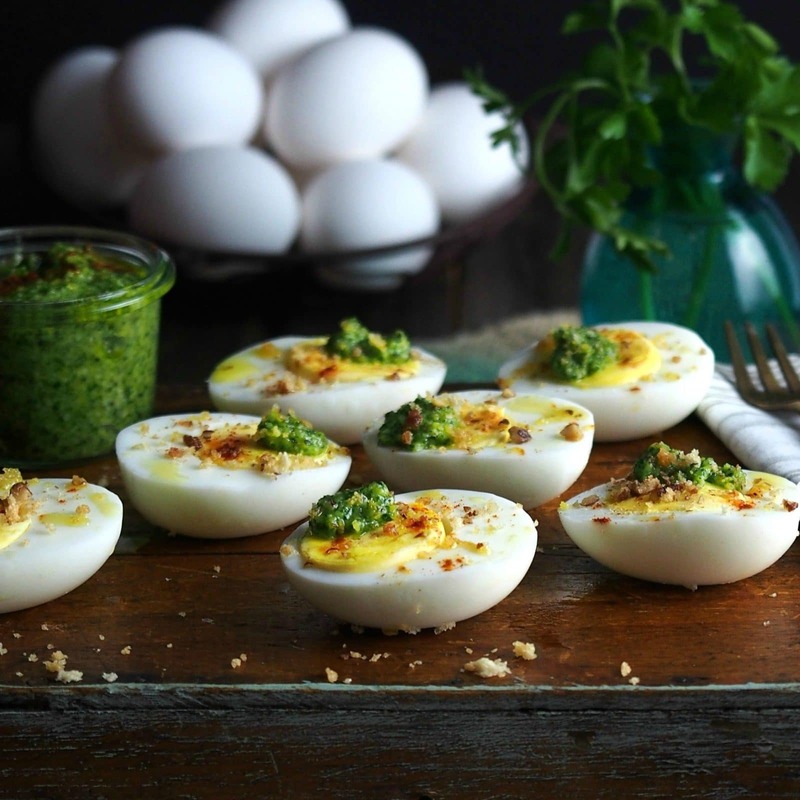 I also love eating it as a vegetable dip, an appetizer with crostini or as Pesto on Eggs (photo below). 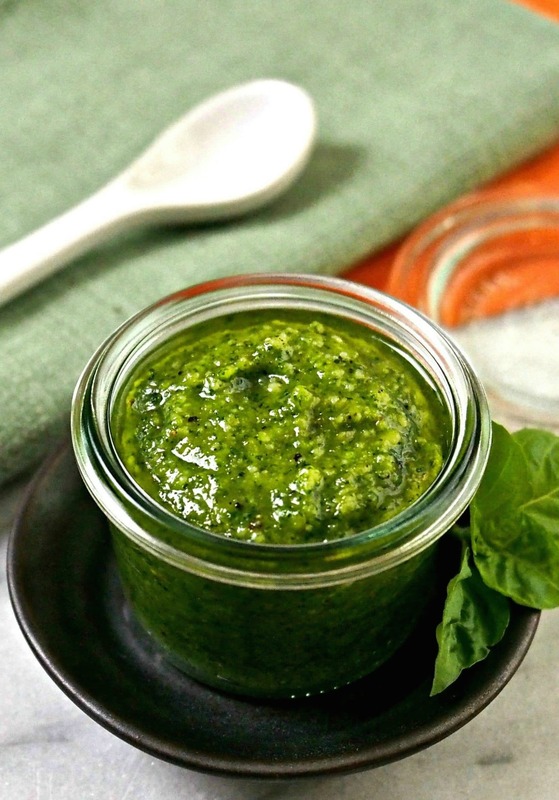 Basil Pesto originated in Italy and derives from the Italian word pestare which means to crush or grind. Traditionally, garlic and pine nuts are ground, using a marble mortar and a wooden pestle, until smooth. Next, fresh basil and salt are added, and the mixture is ground until creamy. Then, and only then, Parmigiano-Reggiano and Pecorino cheeses join in and everything is mashed until it turns into a gorgeous, glorious, green goddess of goodness. Although I’m sure it’s fantastic, I haven’t made it using the mortar and pestle method. I put my trust, and the ingredients, in my food processor. After all, that is why God created it. Poor stripped basil plant. She sacrificed herself and now looks so cold. I’m amazed how many foods I never tried as a child and how many I never prepared for my children. My parents and I aren’t to blame. Our world had never heard of foods like pesto, scallops, saffron, shallots, hazelnuts, molé sauce, naan, spaghetti squash and Gruyere cheese – just to name a few. Due to globalization, the Internet and around-the-clock cooking shows, culinary palettes have expanded and it’s a great thing. It’s so exciting to know there is a multitude of foods yet to experience. 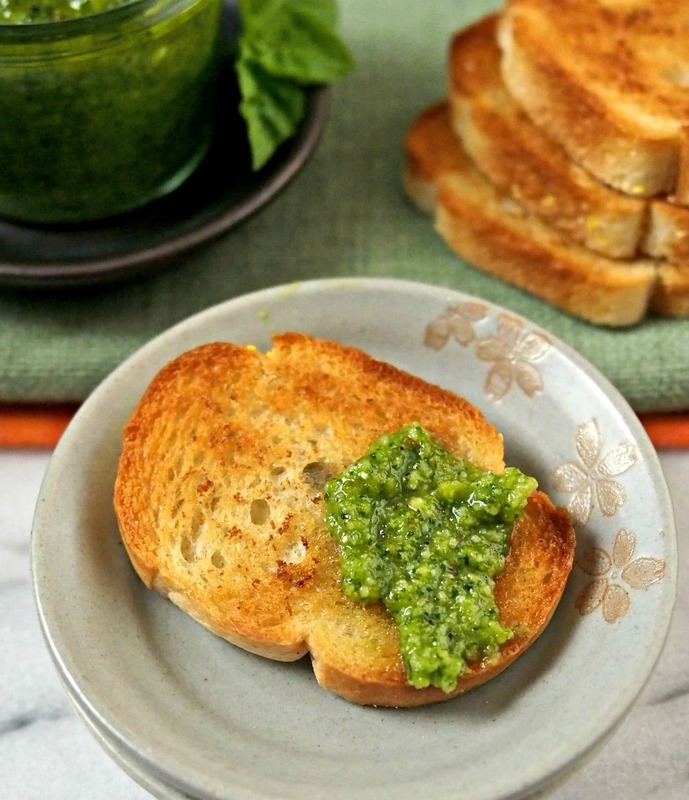 One great thing about Basic Pesto is its versatility. 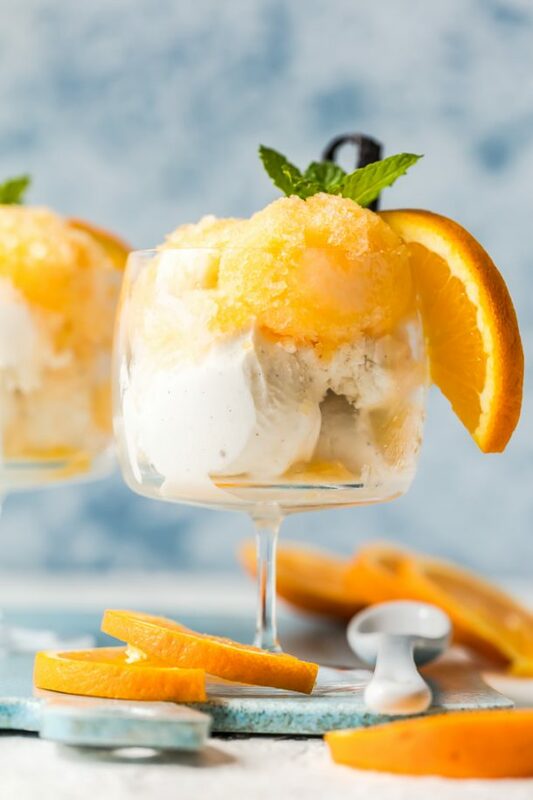 I love it made with basil, but it can be substituted with other leafy greens or herbs like parsley, cilantro and baby spinach. Pine nut seeds are traditionally used in pesto and are delicious, but they are expensive. If desired, substitute the pine nuts for nuts such as walnuts, pecans or almonds. Plus, other less expensive hard cheeses such as Gruyere, Parmesan, Pecorino, Asiago, Romano and Cotija can be substituted if Parmigiano-Reggiano isn’t a cheese readily available. The most important thing to remember is this: pesto is created when green, nuts or pine nuts, cheese, olive oil, salt & pepper are processed together. Play around with the ingredients until you find your favorite pesto combination. 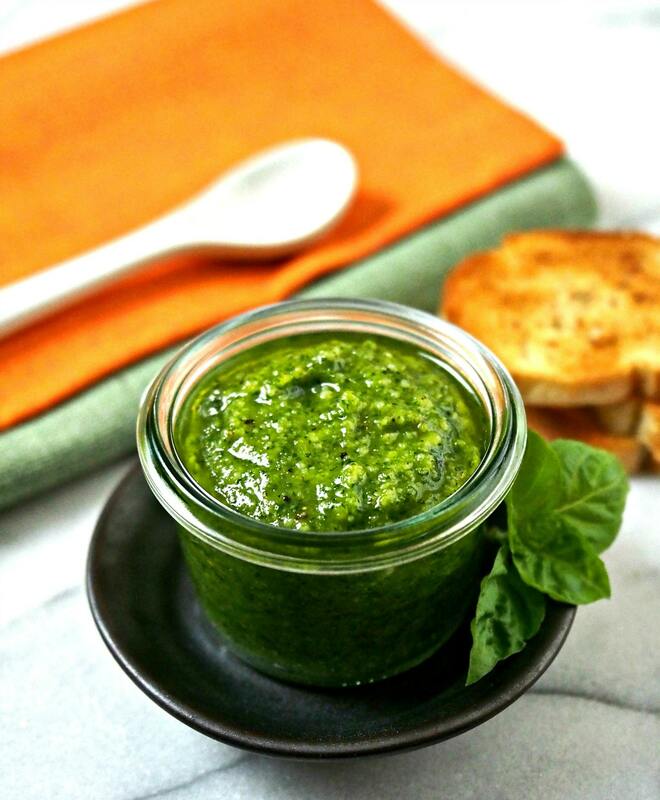 With my first taste of pesto fifteen years ago, I decided it’s a food I don’t want to live without. If you don’t have fresh greens available, it can be purchased already made, but fresh is best, or… best-o (he-he). 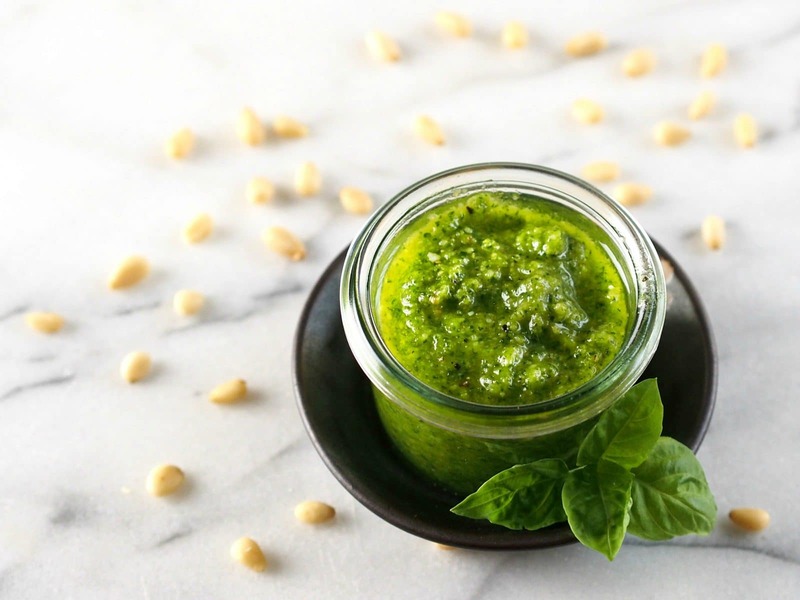 The perfect pesto recipe to use as the base to create your favorite - just substitute other greens, nuts, cheeses and seasonings. 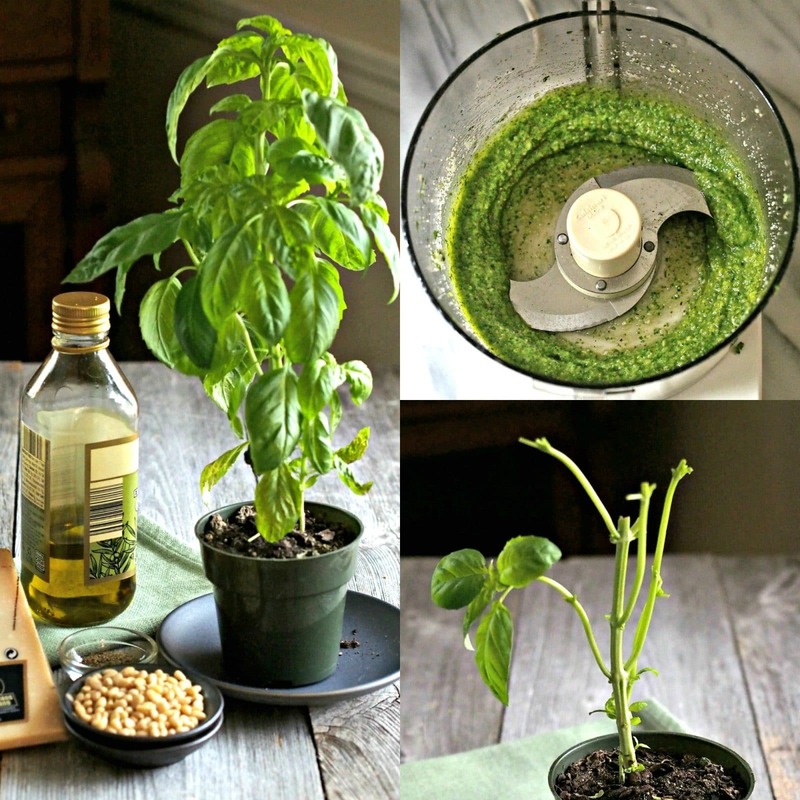 Pesto = Greens + nuts + cheese + olive oil + salt + pepper. ½ cup grated Parmigiano Reggiano Parmesan cheese or any hard cheese. In the bowl of a food processor fitted with the steel blade, pulse the basil, garlic, salt & pepper until coarsely chopped. With the motor running, slowly pour in 6 tablespoons of olive oil and process until smooth and oil is fully incorporated. Add cheese (*see storage note if refrigerating or freezing for later use) and pulse just a couple of times to combine. Serve immediately or *see storage note. *Storage: If refrigerating, place in an airtight container, cover with a thin layer of oil and seal the container. 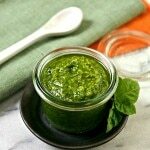 Pesto, especially basil pesto, darkens when exposed to air. Use within 2 weeks and replace oil each time before resealing. If freezing, omit the cheese until ready to serve. Before freezing, drizzle pesto with a thin layer of olive oil. When ready to serve, and after pesto has thawed in the fridge, add the cheese and mix well. Pesto will keep in the freezer up to 3 months. This comment come from Italy, near Liguria, the region where pesto was created. Your recipe is great and really near to original. Very very good!!! Paola (an italian food blogger).